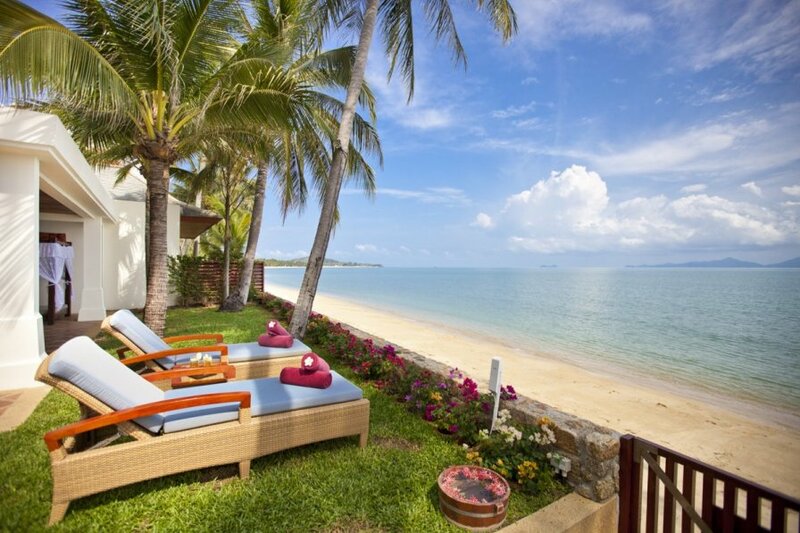 Meters from the soothing sounds of waves softly washing over the white sands of Mae Nam beach. Meters from the soothing sounds of waves softly washing over the white sands of Mae Nam beach, Villa Kanda offers five luxurious bedrooms and spacious living areas on the coast of the beautiful Thai island of Koh Samui. The main living area is behind the artificial lily pond and water feature in the entrance courtyard. In here there are three comfortable sofas in front of a large TV, around a beautiful coffee table. To one side of the living area, across the terracotta garden path, is the huge kitchen. Equipped with everything you need to rustle up a meal or just a light snack – although our chef will be happy to cater for each meal so, if you don't feel like cooking, just put your feet up. There are two large dining tables for ten, both sheltered by the pavilion along one side of the pool. One of the dining tables overlooks the beach so that you can enjoy the world-famous sunsets at the same time as one of our chef's culinary delights! Two of the five fabulous bedrooms enjoy breath-taking sea views, with the other three, have large sliding doors that open into the magnificent landscaped garden. All five enjoy air-conditioning and are incredibly spacious. Desks, sofas, chairs, walk-in closets and of course inviting ensuite bathrooms complete the make-up of each room. All of the bathrooms have crossed over indoors-and-out showers, providing a fantastic opportunity to get in touch with nature and feel genuinely liberated with every washing. The master bedroom also has a spacious patio with sunbeds and sea-views, and an indulgent two-person bathtub, perfect for a relaxing soak in the warm evenings. The beautiful garden is mostly made up of the vast private pool – extending from the stunning living area to the beach itself. Flanked on either side by thriving palm trees and a strip of cool grass, this is the perfect place for a casual chat over a morning dip, or a refreshing swim in the heat of the afternoon. Sun loungers punctuate the lawn and terrace here and there, providing you with the space to relax and enjoy the soft sea breeze and the calming sounds of nature in the authentic tropical ambience. This otherworldly dream destination is located on the north coast of Koh Samui, walking distance from the village and all kinds of delightful restaurants, spas and water sports centres! Villa Kanda is located on the tranquil Mae Nam beach, a five-kilometre stretch of palm-lined, pristine white sand famous for its glorious sunsets. The village of Mae Nam itself is ideal for those looking for a sense of calm – much quieter than its neighbouring areas of Chaweng and Lamai, which are a little more cosmopolitan, though great for a night out or a little retail therapy. Mae Nam, by contrast, historically a fishing village, is somewhat more sleepy and offers a small array of local shops, restaurants, bars and spas. On the beach, you will find various offerings of water sports, which the crystal-clear waters are genuinely made for. Delicious Thai food (especially its famous fresh seafood!) and other cuisines can be found just a short walk along the beach, perfect for a lazy sunset stroll. Mae Nam is on the island of Koh Samui, the third largest island in Thailand. Its size ensures a fabulous blend of comfort and convenience, and it is indeed the perfect size for a tranquil holiday: small enough to retain its charm and character, yet large enough to benefit from a range of high-class bars, restaurants, shops, recreational pursuits, spas, retreats and more – so you can enjoy the facilities of a much larger island without the crowds! It's increasing popularity is making it even easier to access, so whether you're travelling from Bangkok, Hong Kong, Singapore or elsewhere nearby, you should find the journey a breeze.